Welcome to Chiang Mai, Thailand. One of the BEST Cities to Live in the WORLD. Chiang Mai Lanna House is a Thai Company which has Experience and Knowledge in the areas of Real Estate, Service and Management in Chiang Mai. This combination contributed to a strong company with a vast and dedicated staff possessing in-depth knowledge of the markets the company works in. Chiang Mai Lanna House is ready to assist you in buying, renting and building real estate, realestate. ChiangMai Lanna House does not own property on its own behalf but we provide the service to our clients completely independent. 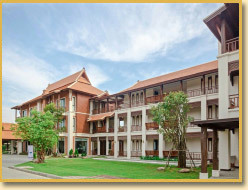 Chiang Mai Lanna House will only recommend the houses which have passed our high standards. The Real Estate market is always changing, what is new on the website today can be gone tomorrow. Also it will take a few days before new houses on the market are added to our website. The house that you are looking for could be one of them. Therefore we recommend contacting us by e-mail. 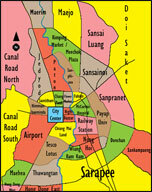 Chiang Mai Lanna House has developed a wide range of services available to house owners. The services offered will ensure that your property will be carefully looked after before, during and after your stay in Thailand. Leave your house in the secure hands of Chiang Mai Lanna House. Please read our Policies before using this Website. You must agree to ALL the Policies before proceeding.